The best blocks for toddlers must play a huge importance on your toddler's development. Playing with blocks toddlers learn balance, engineering, and a thousand principles of physics. From the time when he first enjoys toppling over your towers to the later days when he makes beautiful architectural designs himself, your toddler can be learning with blocks. But what are the best blocks to buy your new toddler? A traditional set of wooden blocks is nice at first sight—but there are many reasons they aren’t ideal for a young toddler. First, he’ll put them in his mouth and chew on them—and even if the paint is nontoxic and lead free, do you really want him to have his mouth full of paint? Not to speak of the dent marks and chipping that a little gnawing will leave the block. Wooden blocks are also problematic for little people because of the way toddlers leave their toys around. 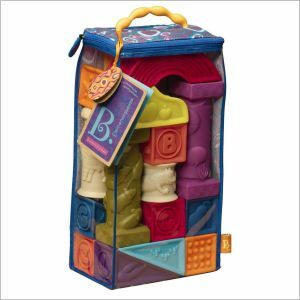 Wooden blocks are no fun to fall on, either for mom and dad or for the toddler. Toddlers also tend to re-purpose their playthings and it is almost certain that one day those blocks will be turned into flying projectiles; i.e.,miniature basketballs. A wooden block can do serious damage to your head, a window, or the vase on the table. That’s why I like to save wooden blocks for my older preschoolers and elementary school children, and give my toddler soft blocks that she can chew on, throw, squeeze, hammer with—and stack. The coolest, safest, and most fun soft blocks on the market at the moment are the B. Elemenosqueeze blocks, and they’re not too hard on the budget either. A set of Elemenosqueeze blocks contains 26 blocks, one for each letter in the alphabet, These aren’t just your standard cubes; there are pillars, arches, and triangular shapes. Each block has a letter of the alphabet and a fun picture embossed on the side, a picture of an animal whose name matches that letter of the alphabet. Safe for little mouths: These blocks are BPA free and contain no phlates, so they are safe for your toddler to gnaw on to his hearts delight. A tactile adventure: the embossed designs means these are fun textures for feeling and mouthing, and the squeezing and squeaking add another fun aspect! Easy to stack: Unlike fabric covered soft blocks, these blocks are firm enough that they can be stacked easily, and your toddler can enjoy making (semi-) tall towers. Large and easily handled: If you’re a toddler trying to build an impressive tower, it helps to have large bricks to start with. These meet the bill. And of course, they are so soft there’s no chance my toddler can get hurt on them. They’re hardly uncomfortable to sleep on! As an added bonus, the manufacturer is eco-conscious and the reusable bag these blocks come in is made of 100% recycled plastic.